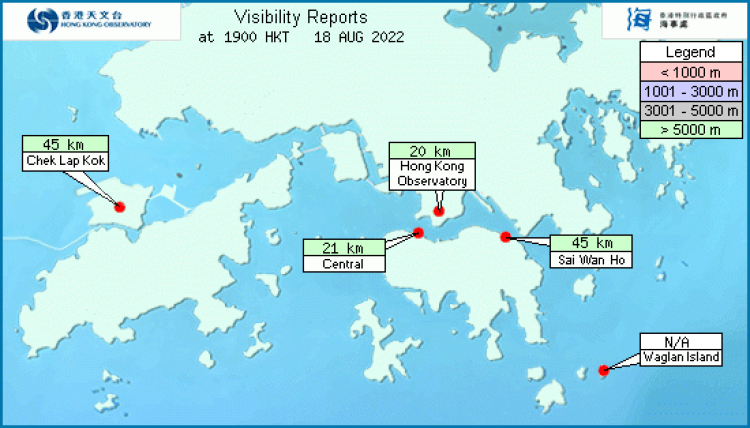 This map shows the visibility readings in Hong Kong Waters at the indicated hour. The readings are provided by the Hong Kong Observatory (HKO) and Marine Department respectively. The visibility readings for Hong Kong Observatory, Chek Lap Kok, Central, Sai Wan Ho and Waglan Island are provided by HKO. The visibility at Hong Kong Observatory is based on hourly observations by a trained meteorological observer. The visibility at Chek Lap Kok, Central, Sai Wan Ho and Waglan Island are derived from automatic visibility readings of a visibility meter and represents the average of readings in the 10 minutes ending at the indicated time. 3. The visibility at Chek Lap Kok is provided by the visibility meter near the middle of the south runway of the Hong Kong International Airport. When this visibility meter cannot provide data, the visibility value will come from one of the neighbouring meters at the airport. The other readings shown on the map are collected by the Marine Department from voluntary ship observers and are available only when low visibility caused by fog, mist or haze occurs within Hong Kong waters. The readings are for reference only and the box at the lower left corner of the map, if shown, indicated the data collection time. 5. The reported visibility ranges between 100 metres and 50 kilometres. A visibility report of 100 metres refers to visibilities of 100 metres or less and, 50 kilometres refers to visibilities of 50 kilometres or more. “N/A” is displayed when no reading is available. 6. On the time series charts below, logarithmic scale is used to facilitate reading, especially at low visibility values. 7. Despite quality control, the automatic visibility reading may occasionally be affected by noises and interferences.